Online Logistics is a young, dynamic New Zealand owned and operated team and we pride themselves on a quality service and hassle free shipping. They are 100% focused on looking after each and everyone's individual needs from beginning to end. Although Online Logistics was only founded in 2013 they have come a long way from their humble beginnings, starting on a small farm in Matakana, and then moving back down to Auckland after 6 months, to service the needs and demands of their clients and now they are shipping 100's of vehicles for people all over the world. Their team has over 20 year's combined experience in the shipping and logistics industry, they know what they are doing and have proved themselves over and over. The team at Online Logistics are made up of car enthusiasts alike, who love what they do. They offer a tailor made service which is hassle free to get the job done, on budget, on time. Whether you are a car collector, relocating to another country or a regular vehicle importer, no job is too big or too small for Online Logistics. 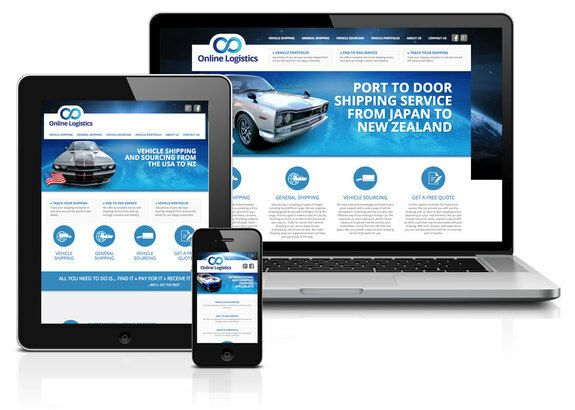 Online Logistics came to us wanting to update their site and future proof themselves for the new responsive, mobile era. After looking after their re-brand we set out to make their web presence reflect their new look. We scratch built a new site running from our CK5 Content Management System, this allows the team at Online Logistics to manage their site content anywhere.